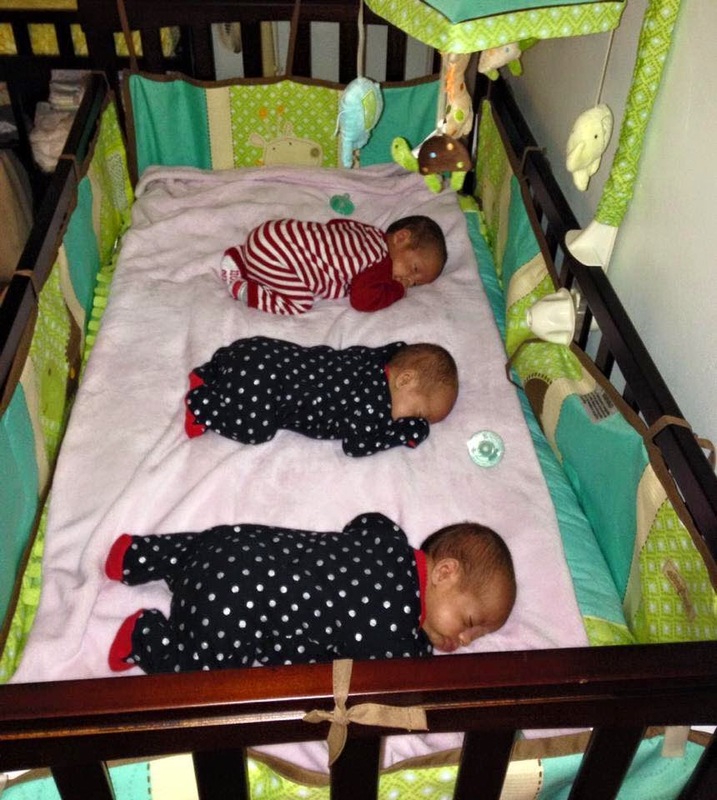 A Special Keepsake Quilt for Triplets! Isn't this the most adorable sight you've ever seen? these little cherubs will have a most wonderful memory to share for many years to come! In my previous blog post, I covered a little bit about making Prairie Points to brighten up a special keepsake baby quilt. There are other unusual elements in this custom baby quilt, particularly the making of large candy-shaped or circle pockets so the babies could be placed in them for a photo shoot! Another big challenge about this project was how to make a "double quilt" or a "quilt and a half ", sectioned in 3 parts, and still give each baby his and her unique personalized area. I must confess, I spent a lot of time in trial and error mode! There was a lot of math that needed to be figured out to make sizing well-balanced. Babies grow fast, so we had to allow room for growth and wiggle room. Thank goodness Teddy came to the rescue. He was able to help determine exactly how much room is comfy room, multiplied by 3! It was easier to visualize the entire project by breaking it down into one section at a time and printing out templates of appliques and fonts to better see proportions. The edges of each circle were finished with a serged rolled hem, then fused to the base fabric with light fusible web for stability, still remaining flexible. Final stitching of the circles to the base fabric was easily accomplished with a small piping foot! Once the circles were in place on the base fabric, it was fun personalizing the entire quilt, one section at a time. The most difficult part of the assembly process was layering all the pieces together evenly. I chose to do this on the granite top kitchen counter because it is the perfect height and width for most of my big projects. It also allows me to secure things with masking tape without damage so my projects stay where I want them to stay. I first laid out the quilt's backing fabric, lining up the center dots to assure even vertical and horizontal appearance in the back of the quilt. After I taped the backing fabric down on the granite top (right sides down), I added a layer of pe-washed 100% cotton batting, making sure it was cut a bit smaller at the edges than the backing, enough to allow 1" of backing to be folded up and used in lieu of bias binding to finish the quilt. Once the backing was in place, I added the embroidered top layer and figured out how to space the Prairie Points evenly across the top and sides, starting from the middle. Because I did not want to make the quilt wider than it already was, I improvised and simply "cornered" the prairie points where I had room at the top and bottom, but not along the entire right and left sides of the quilt. (You will see what I mean in a later picture). Temporary fabric glue was an enormous help keeping the prairie points steady while stitching them together in a straight line! Here is what the pocket version looked like, layered together. To prevent the pocket folds from hanging away from the quilt when not in use, I thought snaps would be an easy way to keep them secure. I first marked dots through all the layers of fabric with a pin, helping me position the snaps exactly where I wanted them to be. Did I mention the most difficult part of this project? Well, actually, it probably was stitching all the layers together, at least for my little workhorse, who simply gave out at this very moment! A few hand stitched reinforcements with fine but strong thread never hurt. Of course, it's always rewarding at the finish line when one adds a signature to the completed project! Sometimes it's tempting to skip details in hidden areas, but it's always worth the effort. It simply shows everything about this item is made with pride and quality, inside and out! Of course, the best part happens when the project is ready for a photo shoot before shipping with lots more welcoming gifts from the family! 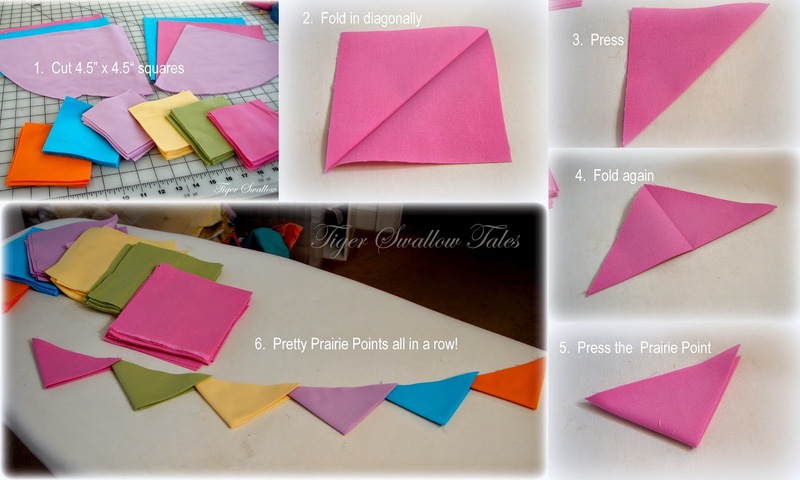 How to make Prairie Points! How elated are you that Spring is finally here? My spirits are much brighter since daffodils emerged in my garden and I can finally work with windows wide open! My latest and most delightful project is filled with bright and cheerful Spring colors! While it's been a challenge at times, it's simply the most irresistible baby quilt I've made so far! Are you ready for this? 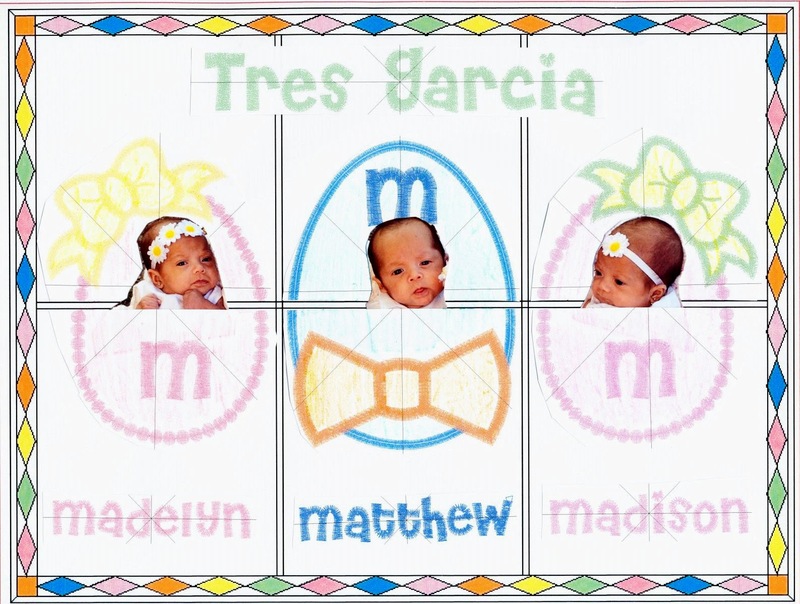 It's a custom order for 3 adorable little triplets!!! 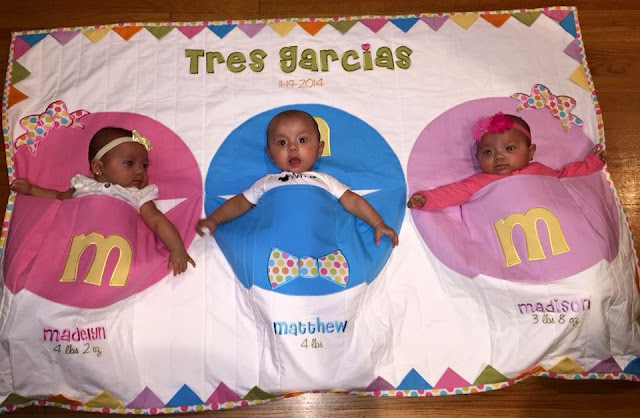 Each of their name begins with an "M"! M&M&M!!! So how do we come up with this very tall order? First, we delight with some Michael Miller Sorbet Color Fabric. So yummy!!! It includes colors for both girls and boys! We have 2 sweet little girls and one sweet little boy! Pink, Blue and Lavender! Then we match up perfectly with solids, thanks to Northcott Fabrics! Then I stress forever, dreading that first cut into virgin fabric, lol. I have terrible "fear of failure!" Thank goodness my customer was very kind to share this picture for inspiration. It's all I needed to get those creative juices flowing! So once I overcome paralysis, I get most of my design idea help using a Quilt Design Software. Although a bit basic and limited, it helps me come up with different design choices, final quilt size, fabric requirements and color arrangements. Everything works with angular shapes so it's a bit tough when you're thinking ... M&Ms ... oooops ... I mean candy circle shapes! Doesn't this bring the biggest smile to your face? Since we were talking M&M Spring colors and shapes, I was inspired by some adorable applique embroidery designs from Munchkyms Design! Owner Kymberly and fellow Etsian was amazing in her effort to custom design larger egg shapes for this purpose. Then we tried to split the eggs in half (so the little cherubs could fit into bottom "pockets" for a photo shoot) and, well, math calculations just did not fit into the equation! Back to the drawing board! The shapes had to be put together the old fashioned way ... stitch by stitch, with my old Pfaff machines! And so the fun begins! Fabric preparation and cutting can be time-consuming and tedious, (especially when karma decides you deserve a tennis elbow attack). Everything gets pre-washed and ironed to assure color fastness and minimize shrinkage. Fresh cutting blades and good rulers make this process so much easier! Miraculously, no rotary cutter mishaps occurred this time ... like slashing or double sewing hidden folds ... ooops! I must confess, when all goes well, playing with fabric and shapes (like making Prairie Points), is the best therapy ever!!! Please come back for Chapter 2 in a few days and check out Craftsy's tutorial on Prairie Points in the meantime!